We're kicking of the first Feel Good Friday of Women's History Month with a shoutout to A Mighty Girl! While this is not a non-profit organization like the vast majority of subjects profiled on this blog, they have a very Feel Good Friday message to share. So who exactly is this mighty girl and what is her message you ask? Let's turn to their website for answers. 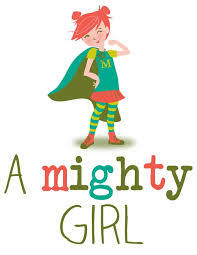 "A Mighty Girl is the world's largest collection of books, toys, movies and music for parents, teachers, and others dedicated to raising smart, confident, and courageous girls, and of course, for girls themselves!" It's a great resource if you're looking for empowering and inspirational gifts for the young ladies in your lives. I've come to this site in the past to find books for my nieces and I know I'll visit again in the future. The site was founded by Carolyn Danckaert and Aaron Smith as a labor of love to help people find books, toys, music and movies that would support and celebrate girls. As they explain, "Girls do not have to be relegated to the role of sidekick or damsel in distress; they can be the leaders, the heroes, the champions that save the day, find the cure, and go on the adventure." Their goal is that the products you can find on their site "will help a new generation of girls to grow and pursue whatever dreams they choose - to truly be Mighty Girls!" Not only do they curate wish lists for young girls, they also have resources on parenting. You can help defray the costs of them maintaining this site by following the Amazon link when purchasing products from the site (so they get a small commission), by making recommendations for items to include in their lists or by giving a straight up donation. Spreading the word is also helpful. I follow their Facebook page, where they share tons of interesting stories about women and girls you may or may not have heard of. You can also follow them on Twitter @amightygirl and kick start this month with some inspiration of the "sisterhood is powerful" variety.